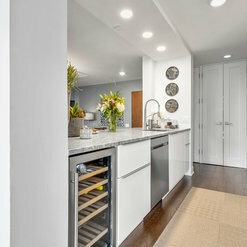 Kitchens from $20,000 to $150,000. Baths $15,000 - $50,000. Finished Basements $10,000 - $150,000. General Contracting from $5,000 to $500,000 These are estimates only- your actual costs may vary depending on the scope of your project. Contact us for a consultation about your project. We are proud winners of the Angie's List Super Service Award- in 4 different categories! We've also been awarded the BBB Complaint Free Award, and for our projects have earned ALL 5-star reviews on Yelp! Chicago Condo On Kingsbury St. Originally we received 5 different quotes for our project, which consisted of removing a few walls, all new flooring for about 1600 sq ft, a new kitchen, and all new closet doors. Chi Renovation came in budget-wise right in the middle, but Ron, the project manager was so great, and knowledgeable that we decided to go with them. We didn't have a waterline on the wall with the fridge, and to make this happen our building wanted us to put in soffits, but Ron worked through it with the building as he knew we didn't like that option. We also had a phone line in our kitchen that could not be moved since it feeds the entire tier of our building, this would have meant we would have to cut out a hole for this in our new backsplash, again, Ron figured out a way to rotate this, which meant that we would not have to cut our new backsplash. Like every project you know there will be hiccups, and each time there was a hiccup Ron was there with options on how to fix it, he was very concerned with making us happy no matter how small the issue may have seemed, he made sure to get it taken care of. We are looking forward to getting quotes from Chi Renovation on doing our bathrooms in the near future! Chi Renovation renovated our master and kids bathroom simultaneously. Ryan, Eric and Nicolai were a great team and were able to do a precise, clean installation. We were going for a modern look with attention to detail. The team was able to carry out the design with great professionalism and were always on time and pleasant. Highly recommend! Great remodel done on our bathroom. Replaced old jacuzzi tub with modern, gorgeous rain shower with pebble flooring and sleek grey wall tile. Painted the bathroom too! Work was completed to the schedule we requested and the team was great to work with--especially Lior and Eric. Would not hesitate to recommend them to friends and family. Thank you! 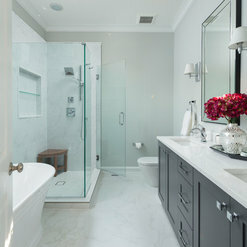 Hi Liane- we are delighted that you are so satisfied with your bathroom remodel. Thanks for the review! 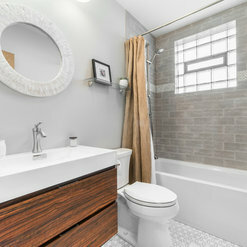 I used Chi Renovation & Design to remodel my guest bathroom, and would highly recommend them to others. 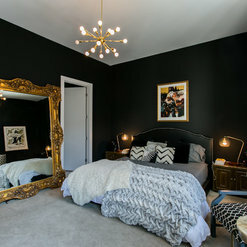 I ended up going with them because they were the most punctual, professional, and organized throughout the consultation & estimate process, and I liked that they were a combined design-build firm, so the project manager (in my case, Ron) would see the whole project through from start to finish. Plus, their estimate was in line with others, and they came highly recommended by a co-worker who'd recently worked with them. I'd intended to do the remodel in June but then had to push the timeline back to the fall, which they were able to accommodate without an issue. Other things I appreciated were that: the team cleaned up the work area at the end of each day, so I never walked into a mess after work, and I pestered Ron with tons of questions and ideas throughout the process, and he was always quick to provide helpful guidance or answers. The project itself (punchlist excluded) took closer to 4 weeks than the 3 originally planned, but I'd call that an on-time finish for any contractor. As for the project outcome: the bathroom used to have a tiny (32x32") shower, ugly beige tile that was difficult to clean, and an even uglier glass block window. I'm really happy with the improvements. Thanks for your vote of confidence! Glad that Ron took great care of you. 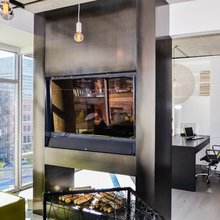 Chi Renovation did a wonderful job renovating our one-bedroom Streeterville apartment. Everyone we worked with (including Julia, Tom, Ron) was professional, responsive, and attentive to our needs. When we first met with Tom to get an estimate, he suggested design ideas and was very detailed in his approach and really listened to what we were trying to do with the space. 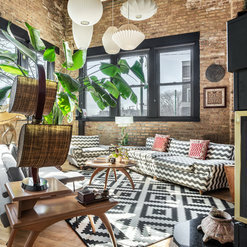 Once the project got going, one thing Chi Renovation did that the other contractors we considered did not do was provide a designer to work with us. He was very consultative and helped us realize the design we were looking for -- from cabinets to colors, flooring, hardware -- everything. And Ron was great to work with as the project manager. Always available for my questions, walked me through any issues that required immediate attention. Only a couple of delays that were related to building management and re-ordering cabinets, but everything went smoothly and as designed. I would highly recommend Chi Renovation if you're thinking about any renovation work for your home. Thanks for the review, Noel! We fully agree with you on the value that designers bring to projects, which is why we always have our designers available to help our clients realize their visions. We needed to re-model our already finished basement after some other construction ruined what was a pretty nice space. After 3 estimates we chose Chi Renovation and Design. They were professional, thorough, responsive, and helped us design a new and better space. Tom was our initial project manager and gave us great ideas with regard to how we could go about the renovation and stay within our budget. The day-to-day work team was extremely professional, highly accessible, and responsive. 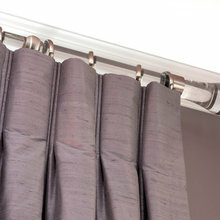 They kept the space tidy and were able to complete the project in a reasonable amount of time. They talked us through their progress almost daily and listened to our concerns as they arose. The finished space is great and exactly what we wanted. We noticed a few issues after all the work was done, but Chi Reno was on the spot to address these concerns immediately. It is clear they care about the projects long after jobs are completed. Thanks for the review, and thanks for having gratitude for our hard work. The Chi Renovation team was fantastic! The designer (Ryan), the project manager (Eric) and the installer (Derek) - all of them were very responsive, helpful, brought options and ideas for different parts of the projects and did an amazing job in a short time. They even managed to squeeze us in within a tight timeline and finished everything 2 days before the deadline. We LOVE our basement bathroom, as do all our guests! Would highly recommend and will definitely call them again for other bathroom projects in our house! Thank you for sharing about your experience of working with your team. We are thrilled you are delighted with the outcome and the timeline! 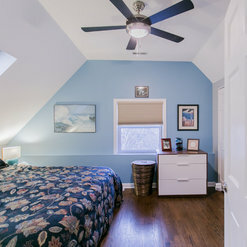 The renovation took about 3 weeks from demolition to finish product. We did not change our cabinets, just repainted and changed hardware through a different vendor but our contractor Ron worked very closely with them. Ron made sure all the timings worked out with sub-contractors like the painters, electrician and appliance deliveries. There was a small hiccup with a delay with the floors since the vendor had those on back order, but Ron was on top of it and worked hard to get it done in a timely manner. When we upgraded our light fixtures in the kitchen we decided to upgrade our light fixture in our dining room and Ron was very accommodating in getting that done too. Ron was on sight when the appliances were delivered to make sure there were no issues. It was a great pleasure working with Ron and Chi Renovation and I would highly recommend their services. Thank you for the review! We are thankful that you had such positive experience with our team. The service provided by ChiR was amazing. This is not our first renovation and as such we anticipated there would be moments when glitches occur. So of course there were a few but what is especially amazing about ChiR and our project manager Lior, was the prompt attention to resolving the issues no matter how small in order to assure that our outcome was the dream kitchen we had been hoping and planning for. 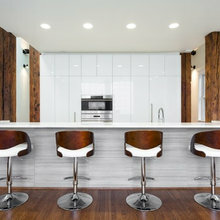 As a result our kitchen is exactly what we envisioned and the process was as good as any renovation project can be. The workers and project manager were prompt, clean, considerate AND attentive to issues like our pets being in the house and our own work and life schedules. The quality of the work is also worthy of mention. 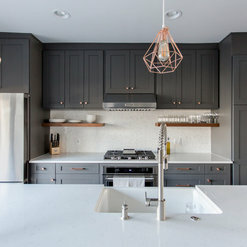 We had originally explored the more moderately priced cabinetry but ended with moving up in our choice to a higher end cabinetry and we are so happy with the results. We also really appreciated the supply vendors/distributors that ChiR uses and the lower prices that they are able to pass onto the client. This helps give you what you want but at a cost that is much more reasonable than other builders might offer. The tile workers were also amazing and attended to small details I would have never seen. Overall it was a fairly painless process and I will plan on using ChiR for any of our future house issues. Hi Laura! Thanks for your outstanding review! 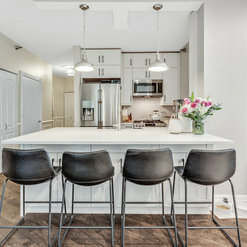 We're so happy to have been the ones to design your dream kitchen - and are hoping you're still enjoying your new design! We're glad that you had a smooth process working with us, and can't wait to work with you again in the future! Chi Renovation did an outstanding job on my bathroom remodel. I have a very small bathroom and because of my experience with contractors (all bad) I assumed this job would drag out because it was a small job. That was not the case at all. When Chi Reno came out to do the quote they had great suggestions on what I could do to achieve what I was looking for while also taking a practical approach. The designer worked with me and we came up with a great design. All the while, it was very low pressure. Never did I get the feeling that there was an up sale going on. With regards to the job itself, my only request was that once started, they devote the resources to get the job done in the allotted time. Chi Renovations came through on this wonderfully. The crew was awesome and professional. They finished the job ahead of schedule. Chi Renovation was not the cheapest quote I received but I can’t imagine another company providing better service and results. I would recommend Chi Renovations if you want the job done right. Nicholas, thank you so much for your stellar review! We can't express how happy we are to hear your satisfaction, not only with the end results but regarding the entire process! We had a pleasure working with you and hope to have another opportunity in the future! My plan was to add a bathroom and bedroom to my basement. A tricky project because of all the piping and the position of the steam boiler and the washer/dryer. Mishneeta had amazing ideas on how to best utilize the space. She was very prompt and very thorough in her planning. No detail of the project was left to chance.I loved how she respectfully discussed the options, came up with great suggestions, and tried to save me costs. She patiently explained the planning process to me, followed up and send out her proposals according to the promised timeline. I would have fully trusted this company to work in my absence. Unfortunately I had to cancel the project. 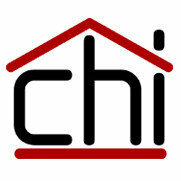 But I'm hoping to work with Chi Renovations in the future. Thank you for your review, Annette! Even though the project didn't go through to the end, we are glad you had a pleasant experience with our team! Just finished our master bathroom renovation! I finally got my steam shower!! It turned out amazing. The tile work, double vanity, the sconces. It all turned out so well. The company, Chi Renovation, was great. Throughout the entire process, they walked us through everything. From picking out the fixtures, tiles and paint to the design and layout. And the contractor that was here working was so wonderful. He was polite and very knowledgeable. We always felt comfortable with him in our home. There were some hiccups along the way (as we expected) but everything was resolved quickly and effectively. The project manager was super responsive and always brought things back on track immediately. If you have a project, they are definitely worth checking out. Thanks for sharing about your great experience working with our team. Congrats on getting that steam shower that you've always wanted! 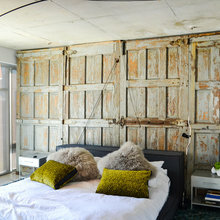 Chi Renovation & Design answered a question: Can you tell us what the paint colors are please? 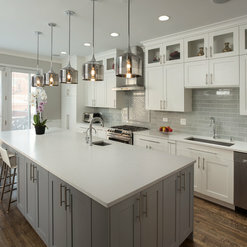 Commented: Needing Advice for BacksplashWhy not try the white subway tile? We think it will go perfectly with the cabinets and countertop. Commented: where to end backsplashWe would end the backsplash where the cabinets end. 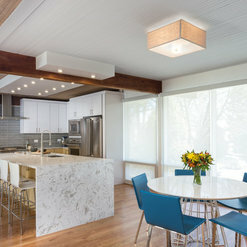 Commented: Need advice: 2 large pendants or 3 over large angled islandWe might look into smaller pendant lights and do three. However if you are keeping the ones you currently have we would do only two.